"We all are proud of the Maharashtra Security Force Jawan for his exceptionally brave act," wrote Piyush Goyal. The young girl almost slipped under a train at Mumbai's Mahalaxmi railway station. A Maharashtra Security Force jawan's quick-thinking and courage saved the life of a toddler on Friday evening. Sachin Pol is being hailed a hero for saving the young girl from falling under a moving train at Mumbai's Mahalaxmi railway station. According to the Free Press Journal, the unnamed girl was trying to board the train with her parents when she slipped and fell in the gap between the train and the platform. To save her from getting dragged under the train that had already started moving, the jawan sprinted forward to grab her. His quick-thinking and presence of mind saved the toddler from being dragged under the train. CCTV footage of the incident was shared on Twitter by Railway Minister Piyush Goyal, who commended on Mr Pol's "bravery & presence of mind." "We all are proud of the Maharashtra Security Force Jawan for his exceptionally brave act," he wrote. The video has been 'liked' by over 16,000 people on Twitter and hundreds have praised the Jawan. Please give him bravery award. He could have died himself saving her. Sincere salute to this man. The Mumbai Mirror reports that both Mr Pol and the girl suffered minor bruises and were given first aid at the station's medical room. This is not the first time this year a serious accident has been prevented at a Mumbai station. 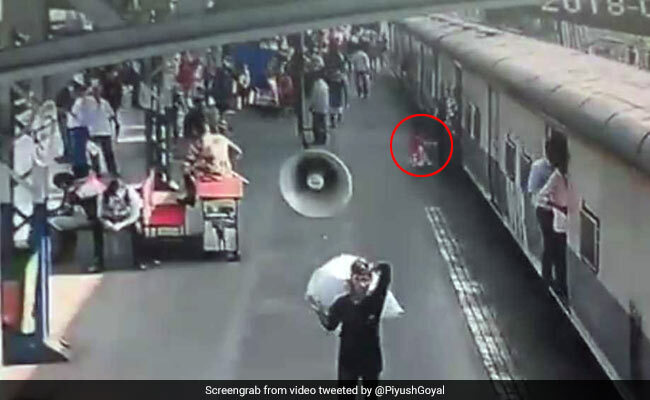 In February, a woman nearly slipped into the gap between the bogie and platform as she tried to board a train at Mumbai's Central Railway Station. Acting quickly, RPF personnel saved her from slipping under the moving train. In a separate incident in April, a woman nearly fell under a moving train and was saved by Railway Protection Force (RPF) personnel and other commuters.